ArmaLite enters the pistol market with a pair of high-caparity 9 mm semi-autos manufactured by the Turkish firm Sarsilmaz. The full-size AR-24 takes a 15-round magazine and has a 4.67-inch barrel, while the compact AR-24K holds 13 rounds in its shortened grip frame and features a 3.89-inch barrel. The thought of reviewing another wide-body 9 mm pistol will nor­mally evoke a yawn from most gun writers. Getting a look at ArmaLite’s new AR-24 pistols, however, was different for two reasons. First, the guns are offered by ArmaLite, creator of the AR-15 rifle. Second, I had heard good things about the quality firearms coming from Turkey but had yet to get a close look at any of them. The AR-24 pistols are manufactured by Sarsilmaz, and please do not ask me how to pronounce that. Sarsilmaz has been in the gun business for more than 100 years, making numerous fire­arms for the Turkish military. The AR-24 is a steel, locked-breech 9 mm semi-auto basically derived from the CZ-75 pistol. It utilizes double-stack magazines and can be fired both single and double action. If the gun is carried in the ham­mer-down position, the first shot is fired double action with all subsequent shots being single action. It can also be carried cocked-and-locked, in which case all shots, including the first, are fired single action. 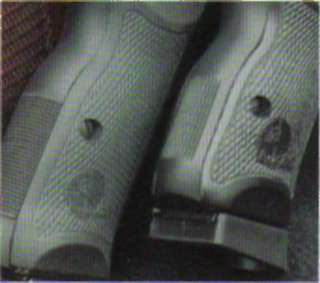 The thumb safety is located on the left side of the slide and locks the trigger in both hammer-down and cocked-and-locked mode. When the right hand grasps the gun in the normal shooting position, the thumb safety can be reached, if not eas­ily operated, by the thumb. Hand size and finger length largely determine how easily the AR-24 controls can be manipulated. I had to move my hand in order to reach and release the slide-stop lever as well. Checkering on the backstrap of the AR-24 enhances grip; vertical serrations perform that role on the AR-24K. 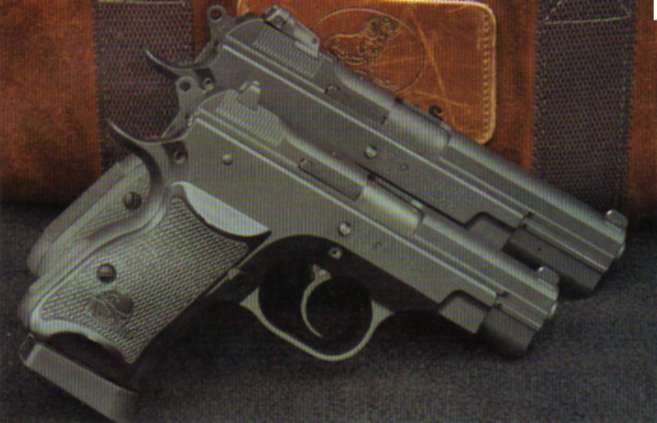 Though the compact's grip frame is abbreviated, the pistol fills the hand nicety thanks to the extended bumper on the magazine. There are two models in ArmaLite’s pis­tol line, the full-size AR-24 and the com­pact AR-24K. The finish on both guns is quite good, and if I sound surprised, it’s only because I was expecting something more like that on a military firearm. Both are black, which I think is cool looking and appropriate for a commercial pistol with a military history. All flat surfaces are smooth, and the pistols’ parts are nicely fitted with no ugly joints or mismatched edges. The backstrap and frontstrap of the AR-24 are checkered, while those of the AR-24K have vertical serrations approxi­mately 1.2 inches long. Grips on the full-size gun are rubber, while early produc­tion versions of the compact feature ones made from wood. ArmaLite now offers the AR-24K with rubber grips, which are avail­able at no charge to replace the original wood grips. Admittedly the 9 mm’s recoil isn’t difficult to manage, but the checker­ing on the grips does enhance the shooter’s hold, particularly when hands get sweaty. Each pistol employs the white-dot sight system with the front blade dovetailed into the slide. Loosening the vertical screw in the front sight base allows the blade to be drifted left or right for windage adjust­ments. The dovetail cuts in the slide are rather elegant with the edges gently curved to engulf the base of the blade. Rear sights are also dovetail-mounted and are available on both pistols in fixed or fully adjustable configurations. The appearance of the sight systems and quality of installation are impressive, particularly the adjustable rear sight. Both guns utilize a modified Commander-style hammer, one of only two features on the guns the appearance of which I don’t like. It just seems coarse com­pared to the pistols’ overall high quality. The backstrap on each pistol has a large beavertail that overhangs the web of the shooting hand. I can’t imagine anyone suf­fering slide bite unless the shooter has the physical characteristics of a Sasquatch. The guns also have guide rods and exter­nal extractors, and while these are not my favorite features on a semi-auto, I can’t criticize them since the pistols cycled flaw­lessly with all ammo fired. At the rear of the slide on both models there are vertical grasping serrations that run for approxi­mately 1 inch and assist the shooter when racking the slide. For those familiar with a 1911 or any semi-auto with a slide of uni­form width that fits outside the frame’s rails, racking the AR-24’s slide may feel a bit awkward because it’s thinner and presents an uneven gripping surface. But the AR-24 is a 9 mm handgun with a 9 mm spring, so it doesn’t take a vise-like grip to do the job. On the plus side, the rails run the entire length of the slide as opposed to the partial-length rails on a 1911. The AR-24 slide is supported no matter what its position on the frame. Based on the CZ-75 platform, the AR-24 pistols are designed so their slides fit inside full-length frame rails. Front sight blades are solidly mounted in dovetail slots and have vertical screws that allow them to be adjusted for windage. frontstrap feel about the same and helps control the gun. There is no mag­azine extension to mate with the compact’s backstrap, however, which makes it feel much shorter than the one on the stan­dard AR-24. Magazine capacity is 15 rounds for the AR-24 and 13 rounds for the AR-24K. The task of loading most double-stack maga­zines ranges from difficult to downright unpleasant, and these were no exception. 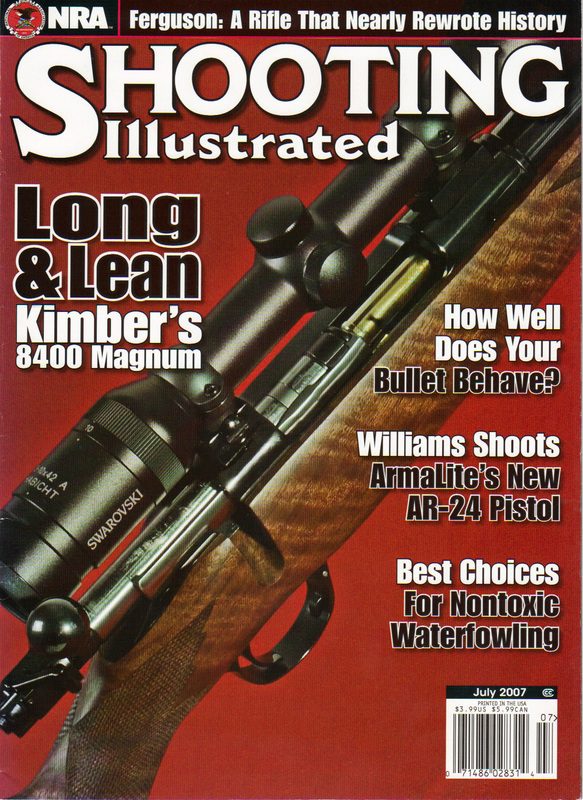 A red, plastic follower in every magazine eliminates the chance of mistaking an empty for a loaded one. The magazines performed admirably in both pistols and contributed to the guns’ perfect function with a variety of ammo. Large magazine release buttons were easy to operate. Ejec­tion of empty magazines was positive every time the button was pressed, and maga­zines dropped smoothly from the frame. The only real knock I can put on the AR-24 goes back to the basic design of the CZ-75. In double-action firing mode, it’s a long reach to the trigger—almost 3 inches from the backstrap. Shooters with small- to medium-size hands usually either can’t get enough finger on the trigger to properly fire the first shot or they cheat by rotating their shooting hand around to the right. While this hand shift works in terms of making the gun go bang, it misaligns the pistol and pushes shots wide of the target. Subsequent shots in single-action mode either feel very awkward or necessitate reacquiring a proper shooting grip. I think the design of the trigger guard contributes to some of the trigger-pull difficulty. 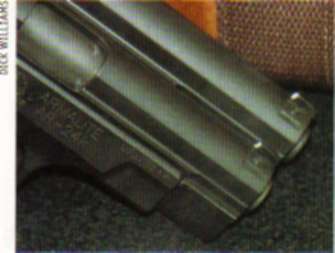 The back of the trigger guard has a very short radius, making it severely rounded. In order to clear the guard when it is pulled to the rear, the trigger has to duplicate that shape. Its curvature forces the trigger fin­ger up toward the pivot point, where you lose the mechanical advantage you would get from a longer lever arm. The double-action trigger pull for my sample AR-24 was 11 pounds, 4 ounces, with the single-action pull being 5 pounds, 11 ounces. The AR-24K registered a lighter 10 pounds, 11 ounces in double-action mode and 5 pounds, 1 ounce with single-action firing. That’s quite man­ageable for a defensive handgun if you can reach the trigger with your hand in the proper shooting position. I tested the pistols’ accuracy at an indoor range, shooting offhand at 50 feet. The lighting wasn’t as good as outdoors, but much better than most real-life, self-defense shooting scenarios. Neither the white dots nor the black rear notch were particularly clear. It was not precise, slow-fire shooting, nor was it Steel Chal­lenge warp speed. When the sights were somewhere in the bullseye area, I mashed the trigger. Despite the AR-24K’s smoother trigger pull, I got better groups from the standard-size gun. The smallest five-shot group for the AR-24 was l 1/4 inches with Black Hills 115-grain jacketed-hollow-point +P ammo. The largest group from the full-size pistol was 2 5/8 inches with Black Hills 124-grain jacketed-hollow-point +P, the same ammo that produced the AR-24K’s smallest group of 1 3/4 inches. Gold Dot 115-and 124-grain jacketed-hollow-point loads gave l 5/8 inches and 1 3/4 inches respectively in the AR-24. These were the only groups less than 2 inches, but again I wasn’t in my Olympic shooting mode. Perhaps a more representative indicator was a string of 10 shots of five different loads in the AR-24. Seven of these were nicely centered in the bullseye and spanned less than 1 1/2 inches, while the three remaining shots went left and opened the group to 3 1/4 inches. That’s way better than combat accuracy from a gun I had never shot before this outing. Except for the long reach to the trigger and its shape, I liked the ergonomics of the pistols. The grip frames are nicely rounded with no irritating edges and fill the hand quite comfortably. With the magazine exten­sion, the compact is almost as comfortable as the standard model except for the shorter backstrap. In fact, the difference in weight between the AR-24 and AR-24K is less than 2 ounces with the full-size gun slightly more than 1/2 inch longer. One of the rangemasters at the Prado Olympic Shooting Range preferred the AR-24K, while my preference was for the standard-size pistol. Despite having hands smaller than mine, he also seemed quite able to operate the AR-24, but then he has considerably more IDPA match experience than I do. Obviously, 15-round magazines make the full-size pistol more useful. I’m not comfortable trying to carry any wide-body autoloader concealed, but given the AR-24’s tough steel construction and 100-percent reliability along with its excellent ergonomics, I think it would make a great self-defense gun where concealment isn’t an issue. It might be even better in .45 caliber.